Moomin is making his first “diorama project” for school! It’s for a book report on Max and Me and the Time Machine, about two kids who go back to vaguely inaccurate “medieval times”, meet an alchemist and some knights, and see a joust. One kid becomes a knight or squire, and the other his (talking) horse. After about an hour and a half of painstaking following-the-directions from 123 Draw Knights, Castles, and Dragons there is a very lovely, tiny, knight on horseback all colored in and cut out! Construction paper sky, bleachers, and grass, and a small clear plastic box colored with different colored Sharpies made the time machine. There’s one more knight to go. Will it be faster this time? Will I be able to curb or at least mask my impatience and my desire to make the diorama myself? No matter how much I love to make tiny craft projects, this one is not for me! I consoled myself by making a space helmet out of tinfoil, for a stuffed tiger. While I’m more than a little annoyed that the teacher spelled “diorama” as “diarama” on the homework instructions, it’s a great opportunity to point out to Moomin how teachers can be wrong as well as how to look things up in the dictionary. 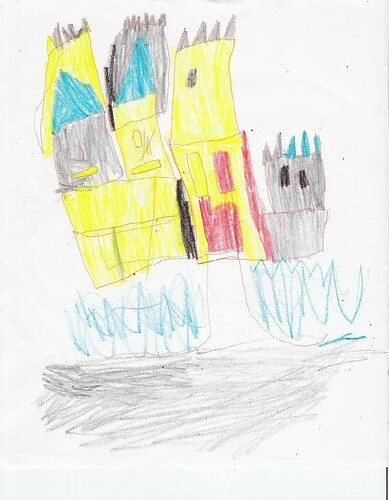 This entry was posted in Creativity, Projects, School and tagged creativity, school. Bookmark the permalink. 16 Responses to Diorama time! I think it's healthy to show kids that teachers are often wrong. Though lord knows that knowledge got me into trouble many times. Hmm…I am not sure what your pretentious attitude is teaching your child. While it is perfectly healthy to show kids that teachers make mistakes, it sounds like you think you are above making mistakes yourself. Is the spelling error really that big of a deal in the scheme of your child's education? Probably not. Is a critical, condescending attitude going to effect your child in the big scheme of things? Probably. Anonymous: you mean "affect", not "effect", right?8-PMoomin is already pedantic. Now it's up to me to make sure he's pedantic and *right*.So I just got him The Book of General Ignorance. Nitpicky fact power!A critical attitude comes from critical thinking. And I believe it is essential to teach kids to question it early and often, preferably in a respectful way in a school environment.Good spelling is very useful, and best picked up here and there from reading and habit. If he weren't already a good speller, or if he really didn't care about accuracy, I wouldn't torment him about spelling. Since he enjoys nitpickery and being right, I let him know when things are spelled wrong. Big, strong children (and adults) like to exercise their bodies and display their physical power. Know-it-all geeks get into that too, but with their brains. I am very much happy to read this post and I think it is very useful to know about diorama project. Moomin has done a great job and I guess Moomin could complete it very well. Thank you very much! This is really wonderful to see this kind of online college papers services. These are all using to create many educational reviews and content writing books. So, I am very happy to use these online essay writing tips. Looking a decent art piece. We can bring colors of live on the papers with such awesome painting to impress others. Get free chaturbate tokens generator here and then generate free chaturbate tokens. ﻿huawei honor 8 etui �?